Retaining wall is the outer wall that has a function as a soil reinforcement condition to keep stable and cannot slide or protected from erosion. Retaining wall is often applied on the ground conditions are skewed or have different levels of elevation. But if applied with a good retaining wall could be an adder to the attraction of the building. There are even people who are interested in making this element to create a garden decor but should not forget its main function. When viewed from the classification, there are three types of retaining wall or retaining wall. First is the type of gravity, the retaining wall that makes the weight or weight of the material and the material maker as the main element to withstand the load of the soil. The material is often used is a stone or often called gonjion. The second is retaining gravity. In addition to making the weight of material as a mainstay of load restraint, the weight of soil reinforcement also serves to keep the structure in order to remain stable and not change and decrease. While retaining the third is non-gravity, prefer the concept of construction and the strength of materials to keep the soil stable. 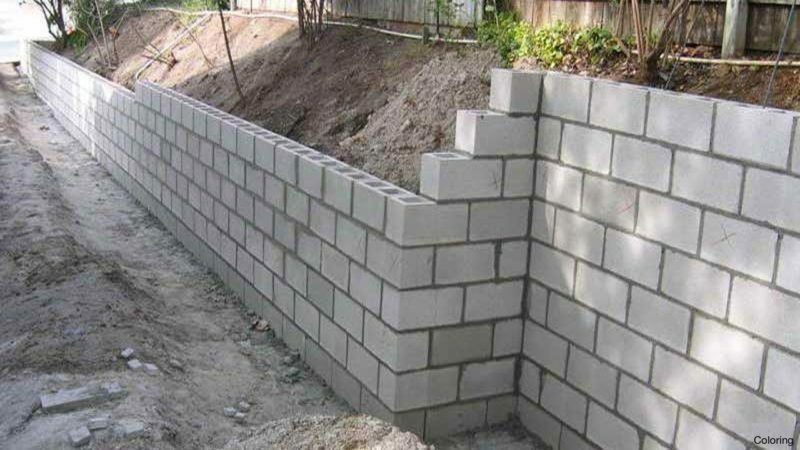 Then when viewed from the material or materials used to make it, this retaining wall can be divided into several types. The first is a retaining wall of concrete. The advantages are stronger to hold the ground load but the shape is too simple. If you want to make it look more interesting, this can be done by closing the concrete with natural stone and make it as a decorative wall. But of course this concept requires more funds because the manufacture of concrete itself takes a considerable budget. The second is to use materials from wood. The use of this material can only be applied to areas or locations of smaller size and not too high. Because the strength of wood is less good than concrete. In order to be stronger to withstand the burden of this application system must be equipped with a beam on its construction. And certainly, the wood used quality must be guaranteed and able to deal with changes in the weather. And that should not be forgotten, when created should be given a layer of anti-fungus and mosses as well as waterproofing so that the process of wiping can be avoided in more leverage. The use of this material is more suitable applied in buildings that also use wood as the main element. The third is the retaining wall of the paving block. Now the use of paving block material to make retaining wall or retaining wall more and more liked by many people because the application system is very easy to do. Because this material is made with a standard size and have a shape that is always precise and symmetrical so that the installation process can be done easily. If the size of the wall is large enough and high and the volume of soil that must be withheld more and heavy weight, then the installation of this paving block should be equipped with construction and adhesive. However, if only small, the adhesive is not necessary. But for the construction should still be made even though the concept is simpler. Finally, the retaining wall of natural stone. The use of this material can make the retaining wall look more beautiful and natural characters and nuances stronger. Retaining from natural stone is very suitable to be applied to buildings that use the style of tropical architecture. The thing to consider when making it is, the application system must be considered carefully because of the size of different stones. So the arrangement of the stone must still be able to make the surface of the wall remains flat and not wavy. Preferably the stone is attached with cement so it is stronger to withstand the load.